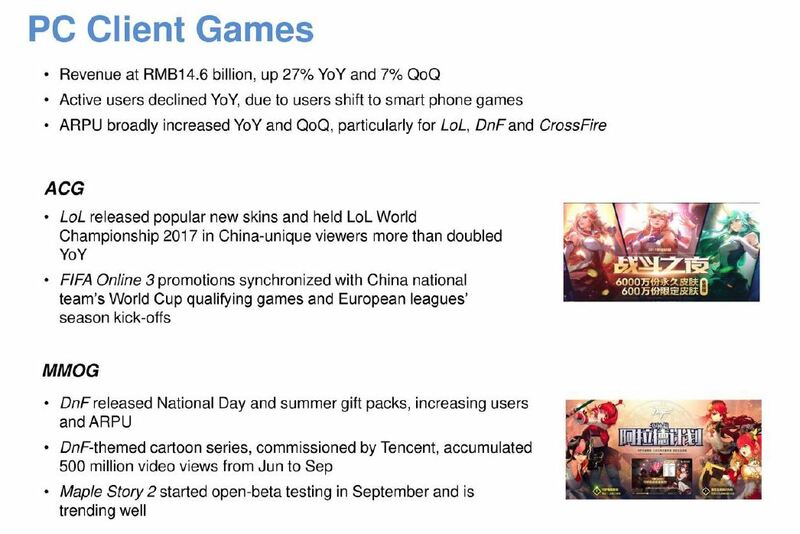 Tencent’s Q3 earnings revealed that Worlds viewership doubled over last year. For the first time this year, the League of Legends World Championship was held exclusively in China. China is—by far—League’s most important region in both playerbase and online viewership for esports. According to data from Esports Charts, over 98 percent of Worlds views this year came from Chinese fans. The decision to locate its most important tournament in China paid off, as total unique viewers doubled from last year, according to Tencent’s 2017 Q3 report. Tencent is a Chinese internet conglomerate that owns Riot Games, publisher of League of Legends. 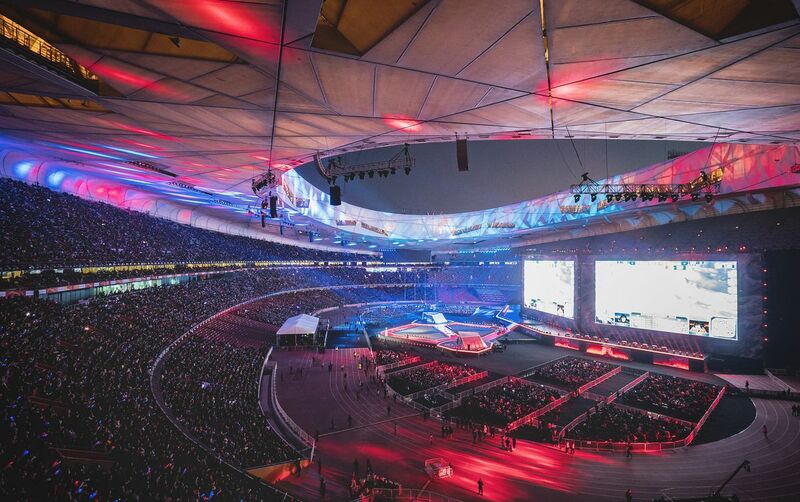 On the webcast, Tencent revealed that unique viewers for the Beijing finale totaled 60 million, compared to 43 million last year. Tencent executive James Mitchell tabbed the final as “one of the most-watched live sports events of any kind this year in China.” Based Esports Charts’ data, the overall peak wasn’t even the finale—it happened during SKT’s semifinals match with Royal Never Give Up, a Chinese team. In addition to solid viewership for esports, Tencent’s PC games reported a 27% year-over-year increase in revenues for the quarter. Active users saw a decline, however, as the user mix shifted from PC to smartphones. 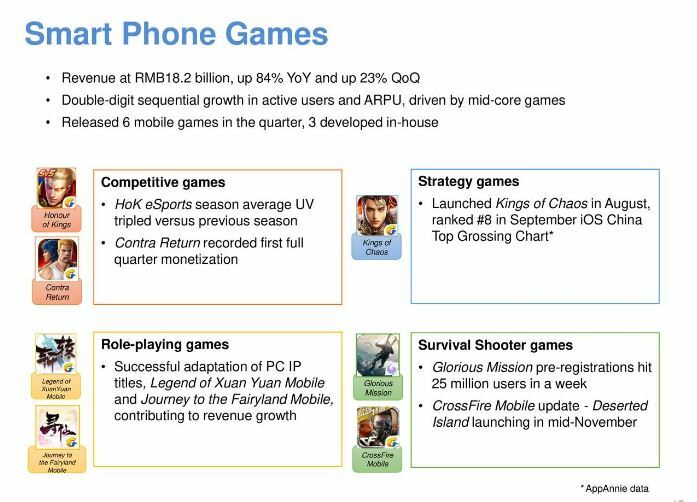 Tencent announced increasing initiatives in mobile genres, including a pipeline survival-style and battle royale game. The company believes that there is latent demand for innovation within those genres, as evidenced by strong reception for fresh titles.